The Settings tab provides the facility to set and modify the general appearance of the final chart. This series of tick boxes determines which date intervals will appear in the date zone(s) of the viewed or printed chart. By default the date zone has the earliest date at the top with time increasing as it goes down the page. Some organisations prefer the earliest date to appear at the bottom of the date zone with time increasing as it goes up the page. Ticking the 'Upwards' box makes the earliest date appear at the bottom of the date zone. These selection buttons determine which horizontal and vertical grids appear on the chart. Ticking the chainage box causes grids to be drawn at the specified major and minor chainage intervals. The different elements of the text elements of the standard chart appear in the drop down list. For each of these elements differing fonts can be selected for printing and screen viewing by using the printer and screen font selector. The colour of the text associated with activities is set by the appearance of the activity as defined in the Key. This can be over ridden and all text can appear in black by ticking the 'All text in black' tick box. By default the background to any activity text is transparent. With some backgrounds particularly in the middle of boxes the text can be difficult to read. Ticking the 'Opaque background' box causes all activity text to be printed on a solid background. When viewed or printed by default the only chainage values shown are at the selected major or minor intervals. Ticking 'Show Start Chainage' will print the start value of the range even if it does not occur at a standard interval. The relevant range name as set in the grid on the Chainage tab can be shown above the chainage if 'Show Range Names' is ticked. It the range name fields on the chainage tab are blank, ticking 'Default Range Names' will use Range A, Range B etc. as the range names. Note this setting has no effect unless Show Range Names is also ticked. If multiple ranges are used ticking 'Hatch Range Gaps' will cause the interval between the ranges to be filled with hatching. Selecting chainage vertical turns the displayed chainages through 90 degrees, the text can be displayed facing either left or right. 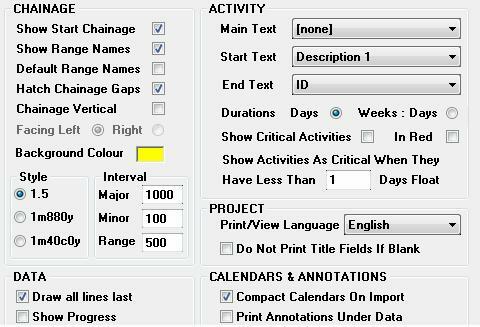 The background colour box allows the changing of the background to the chainage and date areas of the chart. Clicking on the box brings up a colour selector. The Major and Minor intervals specify the minimum distance between the markers in the chainage area of the chart. When the scale becomes too small to clearly show these intervals they are automatically adjusted to a more suitable interval. When more than one range is used the Range interval specifies the default distance between adjacent ranges on the chart, this is used if no other specific interval is specified between ranges on the chainage tab. Each activity on the chart can have a text description at the start, end and in the middle of the activity. The 3 drop down boxes allow selection of any of the activity data fields to be displayed in any of these positions, alternatively [none] can be selected in which case no text is shown in the selected position. Where durations are shown in the the descriptions on the activities or in the data they can be shown in days or weeks:days e.g. a 9 day duration can be shown as 9 or 1:2 (Note: the duration of the week is dependant upon the activities calendar. Duration of less than a day are not currently supported directly, but timescales can be shown simply as units if desired therefore a day can de used to represent any time period. Critical activities as defined by their float can be highlighted by placing '(c)' after the Start Text and/or by colouring the activity red. Selecting this ensures that all calendars are compacted when imported from planning packages. This is the default setting. See Calendars for more information. Usually annotations are printed after the data and therefore on top of the data. Select this option if it is desired to print the annotations under the data instead. Ticking this check box ensures that all boxes are drawn before any lines are drawn. This is the standard setting as it is usual for activities drawn as lines to appear over the top of activities drawn as boxes otherwise they can be totally obscured. Ticking this check box shows all the recorded progress both on the viewed and printed chart. On the printed chart the progress legend is also shown. This permits the calendar and legend language shown on the viewed and printed chart to be set.